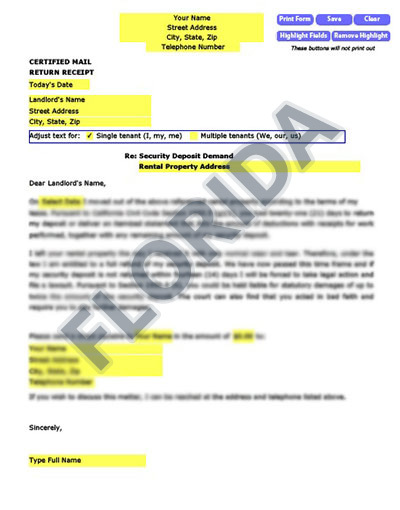 Florida tenants who have requested their security deposit but the landlord has failed to respond or repay the owed amount should send a Security Demand Letter that gives them the last warning. Failing to repay the owed security deposit in good faith within the statutory time of 15 to 60 days (depending on whether there are disputed itemized deductions) is against the provisions of the Florida landlord-tenant laws. One can opt to file a case against the landlord, but with the stress and lengthy court proceedings that come along with it, the best option would be to send a professionally written security demand letter that lets the landlord know that you know the laws and are ready to take legal action against them. A lawsuit against the landlord comes with consequences if the landlord has violated their legal obligation and letting them know that you are determined to push the matter to court will make them pay back the security deposit. This letter is usually all it takes to get back your security deposit when everything else out of court has failed. The letter, with reference to the laws of Florida, warns the landlord of their interest to withhold the tenant’s security deposit against the state’s civil code. To get back your security deposit, all you need to do is download, fill and send this letter to the landlord. Any correspondence and communication that is done with the landlord should be done in writing to keep record and proof if the matter goes to court. Also, make a copy of the letter and send it via certified mail to get a return receipt. Our letters for Florida Security Demand Letter renters are tailored to your state, with the right laws to get your landlord’s attention. We’ve taken care of the Security Demand details so there’s no hassle on your part to find the right law and craft an approrpriate letter. Our letters have been used in Florida Security Demand Letter and all over America with great success.